Beholder (Henny Hughes – Leslie’s Lady, by Tricky Creek) is officially back after trouncing her competition in the Adoration Stakes (GIII), the first graded stakes start of the mare’s five-year-old season. 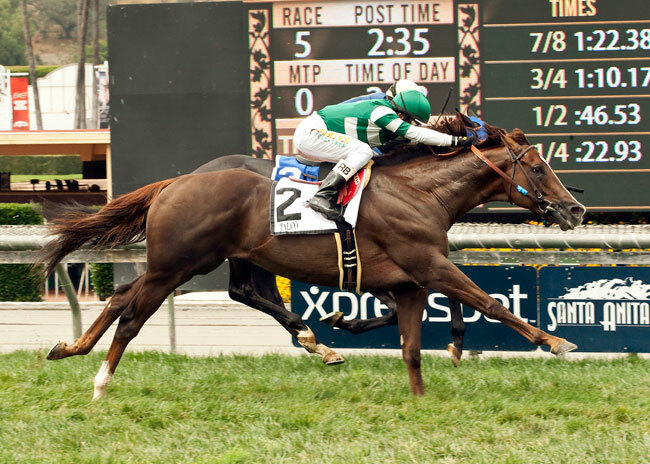 The title holder of the 2012 Champion Two-Year-Old Filly and 2013 Champion Three-Year-Old Filly awards has now reeled off two consecutive victories at age five, the first of which came in April’s Santa Lucia Stakes, and she has left few questions about who is leading the distaff division with her victory in the Adoration. 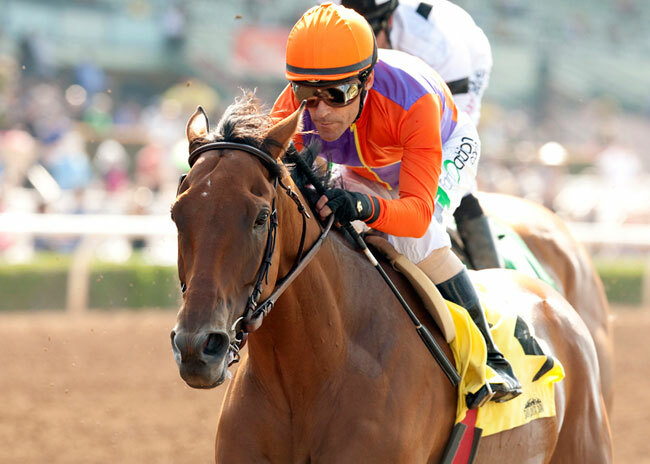 Jockey Gary Stevens kept Beholder wide into the first turn in stalking position, and by the final turn, she was vying for the lead. She gained the advantage and remained under a steady hand ride to the wire, easily holding off her most worthy rival of the field, Warren’s Veneda, by 1-1/4 lengths. Replay. 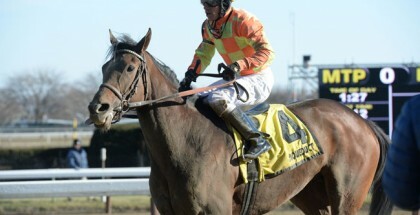 King Kreesa (King Cugat – Storm’s Advance, by Storm Creek) pulled off a solid upset in Belmont’s Poker Handicap (GIII). 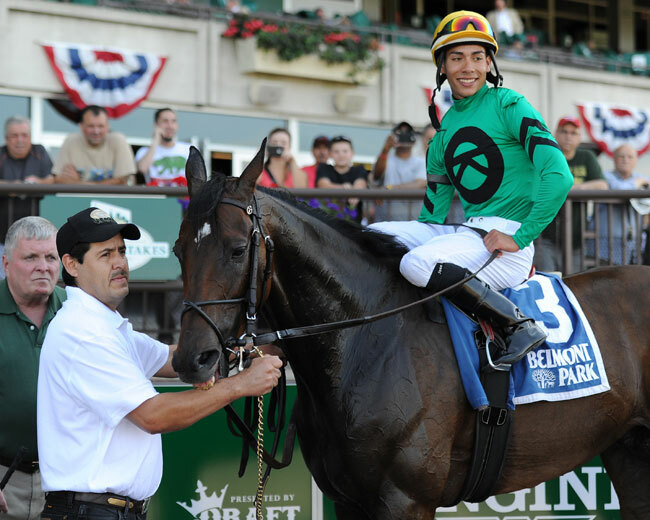 Already a graded stakes winner, the six-year-old gelding was able to collect his second lifetime graded stakes victory with the first win coming in the same race in 2013. King Kreesa has struggled to find the finish line first since August of 2014, but it seems that he’s on the upswing. In the Poker, he established the lead from the start in easy fractions and remained there until pressured. 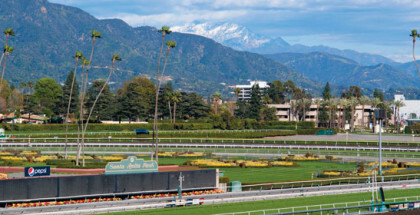 King Kreesa immediately picked up the pace for the final furlong of the race and held on strongly enough to prevail by three-quarters of a length over Vyjack with the favorite Il Campione a head behind in third. Replay. Although the Brazilian-bred Bal a Bali was quite favored, it was another internationally-bred colt who stole the Shoemaker Mile (GI). The French-bred Talco (Pivotal – Trylko, by Diesis) has done quite well since arriving to the turf of the United States. In his eight races prior to the Shoemaker, five of them were graded, and he has yet to finish worse than fifth. Content to settle on the inside at the back of the five-horse field, Talco waited to make his strong closing move in the stretch. It was a strong move indeed as Talco quickly made his way to the wire three-wide down the stretch, and by the final sixteenth of a mile he had gained the advantage. In doing so, Talco claimed his first graded stakes event in the United States by half a length over Midnight Storm. Replay. Playing as a longshot, Frivolous (Empire Maker – Sixty Rocketts, by Belong To Me) bested her many worthy opponents in the Fleur de Lis Handicap (GII) to secure a purple saddlecloth in October. 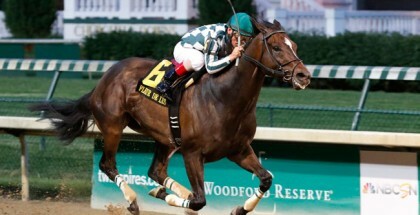 A rather inconsistent runner, the five-year-old mare has landed a graded stakes win in the Grade II Fall City Handicap and placed in last year’s edition of the Fleur de Lis. Although she entered the starting gate as the second longest shot at 32-1, this time Frivolous had no intentions of finishing anywhere other than first. Frivolous pressed the pace for most of the race, but down the homestretch, she was home-free, finishing 1-1/2 lengths ahead of Sheer Drama, the overwhelming favorite. Replay. 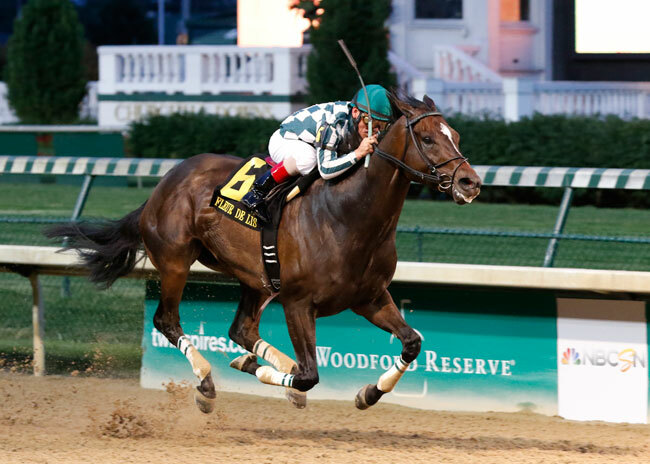 Noble Bird (Birdstone – Anyhow, by Tiznow) cemented his place in this year’s Breeders’ Cup Classic with a win in the Stephen Foster Handicap (GI) under the bright night lights of Churchill Downs. The four-year-old chestnut colt was last seen in his stakes debut in the Alysheba Stakes (GIII) in which he finished second to Protonico by a head. With no Protonico to steal the show away from him, Noble Bird ran an impressive race against top older horses such as Lea and Hoppertunity. The colt settled in second to stalk the pace, but by the far turn he had taken over and was leading the pack into the stretch. Noble Bird drew clear but was soon pressured by Lea, a rival he kept at bay to win his first graded stakes by a neck. Replay. 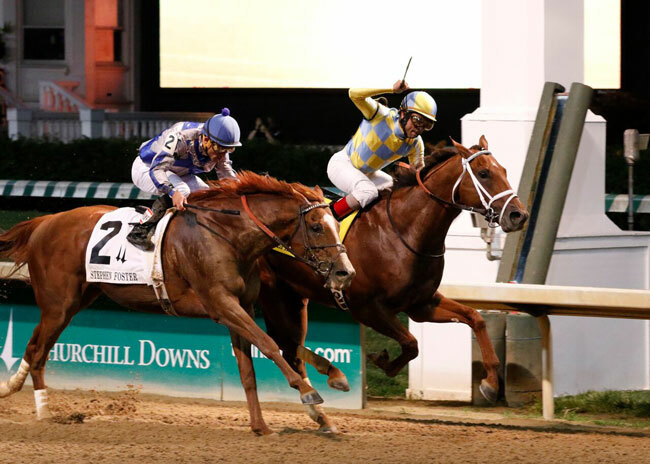 Noble Bird (inside) and jockey Shaun Bridgmohan take the Stephen Foster Handicap at Churchill Downs on Saturday, June 13, 2015. As if to prove he should not be overlooked among the impressive crop of three-year-olds, Island Town (Hard Spun – Humorous Gal, by Distorted Humor) held on gamely to take his first graded stakes victory in the Matt Winn Stakes (GIII). The winner of a maiden special weight and allowance optional claiming event, the Matt Winn was Island Town’s first graded stakes start. The chestnut gelding took the lead at the start and held onto it until he lost it to Fame and Power in the stretch, at which point it looked as if he had given up the race. Island Town was roused by jockey Julien Leparoux, and together the two rebounded to the lead ahead of the favorite to score a half-length victory.